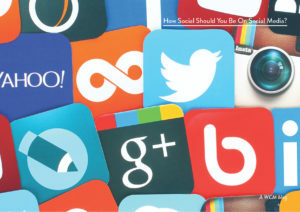 How social should you be on social media? Home / Blog / How social should you be on social media? When it comes to posting on social media, what’s the best recipe for success? How often you post can either drive engagement or lead to disinterested followers. Because social media is an integral part of a successful content strategy, it’s important to understand the fundamentals of frequency and consistency to make the most of your social accounts. Below, we’ve culled some best practices for the most popular platforms. Facebook. According to SocialBakers, brands should post to Facebook five to ten times per week. That averages to one to two posts per day, including weekends. Be careful not to exceed two posts per day. After two posts in a day, likes and comments tend to trail off. Make the most of your two posts each day and include videos and photos, which have higher average engagement than text posts. LinkedIn. LinkedIn is the best platform to reach professional audiences. According to a recent report, businesses that post 20 times per month reach 60 percent of their audiences. To achieve that level of engagement, aim for about one post per weekday. As a professional platform, LinkedIn tends to get less traffic on the weekends. To make sure your posts are reaching career-minded audiences at the right times, stick to weekdays for the most impact and save weekends for a recap post. Twitter. Research shows that the more you tweet, the more chances you have to engage with your audience. With each tweet’s shelf life averaging just under three hours, marketers can use the platform often and even repeat tweets three to four times a day to maximize existing content. To get the most out of your Twitter strategy as a small business, aim for 5 tweets a day. After that, response per tweet drops off. Pinterest. Brands like LL Bean and Whole Foods saw a correlation between frequency of pinning and traffic growth. They did the best with multiple-times-per-day posting strategies. This helps with steady, sometimes sensational, growth. Aim for five times a day. Instagram. Aim for 1 photo a day, though engagement does not drop off, many brands find it difficult to maintain the quality of post. Union Metrics analyzed 55 of the most popular, active Instagram brands and learned that most were posting once or twice per day. The most important thing to remember about posting to social media is that it’s okay to experiment. Try tweeting 8 times per day for three weeks, and then switch to 4 times per day for three weeks and see how your followers react. With analytics, you can measure how your audience responds to changes in posting frequency. A Facebook, Twitter, and LinkedIn posting schedule that works for one organization might not work for another. Once you go through a testing period, work with your team to nail down a schedule and stick to it. Your social media plan is an important muscle—and if used effectively, can be a significant driver of audience engagement—in the overall body of your content strategy.